proceed with the trial of the embattled Chief Justice of Nigeria, Justice Walter Onnoghen at the Code of Conduct Tribunal. It was confirmed at the CCT that Onnoghen’s lawyers have filed their final address. The Nation reports that the prosecution team is expected to submit its final address today. 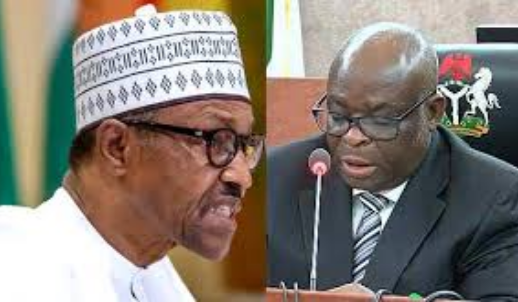 Justice Onnoghen is said to have bungled his chances to meet with President Buhari to resolve the impasse amicably in the interest of the Executive and the Judiciary. After Justice Onnoghen’s resignation, it was not immediately clear whether or not President Muhammadu Buhari would direct that his trial at the Code of Conduct Tribunal be stopped. While some government officials wanted the trial concluded, some members of the Bench and the Bar insisted on the decision of the National Judicial Council (NJC) to retire Justice Onnoghen. Although the President was said to be weighing options on the NJC’s report, which made recommendations on Justice Onnoghen’s future, a government official said his trial will be concluded. The source said: “ The government will not withdraw the case against Onnoghen in CCT in order not to set a bad precedent. We want the case to run its lifespan for posterity and to avoid reading of political meanings into it. When this case started, there was much uproar, that it was politically motivated by the presidency. We want the tribunal to decide the case on merit. The source, who stressed that there was no deal with Justice Onnoghen over his trial, claimed that the CJN bungled his chances to decide his fate in the interest of the Judiciary. The source added: “There were moves to prevail on the President not to allow the CJN to be on trial in CCT. The first window came from the Nigerian Bar Association (NBA) which sent a delegation to Vice President Yemi Osinbajo. The NBA team wanted soft-landing for Onnoghen. Some terms were agreed upon, including resignation or voluntary retirement by Onnoghen. “The NBA team was mandated to prevail on him to quit honourably in view of some overwhelming allegations and investigative reports on him. The CJN, who was initially amenable to reconciliation, later backed out. “The second mediation was about another proposed confidential session between President Buhari and Onnoghen, which was facilitated by some highly-placed Nigerians. They wanted the President to hear from Onnoghen to pave the way for his quiet retirement from office without subjecting him to trial. The CJN consented to the session with the President but he aborted it at the last minute without any justifiable cause.